Receiver, PN 12524301: Stamped with "M242 ENH" on the receiver side. Feeder Assembly, PN 12524100-1: Has "quick detachable" bridges. Barrel Assembly, PN 12524520: Ribbed barrel assembly with chrome lined bore. b. M242 ENHANCED GUN UNIQUE COMPONENTS. While the Standard and Enhanced M242 guns share many common components, the Enhanced M242 uses a number of components that are unique and are not interchangeable with the Standard M242 parts. (a) Physical differences: The M242 ENH recoil mechanism uses one less inner and outer ring springs in the recoil spring sets. The damper housing is modified to accommodate the shorter spring stack. All other recoil mechanism components are common with the standard M242 recoil mechanism. The M242 ENH recoil housing cap has an overall length of 4.3 in. (109.1 mm), making it 0.2 in. (4.9 mm) shorter than the older caps used on the standard M242. (b) Interchangeability: The M242 ENH recoil mechanism is not interchangeable with the Standard M242 recoil mechanism, and may only be used in the M242 ENH. The inner and outer spring sets, and damper housing are not interchangeable with the Standard M242 recoil mechanism components. The M242 ENH gun requires the short recoil cap, PN 12524529. 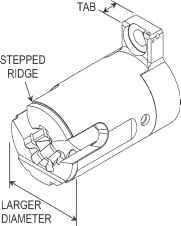 The Standard M242 may use either recoil housing cap PN 12524422 or PN 12524529. (a) Physical differences: The breech outer diameter was increased by 5 mm, and a stepped ridge is cut into the breech's aft end. The recoil mechanism tab thickness was reduced to provide the correct interface with the M242 ENH recoil mechanism. 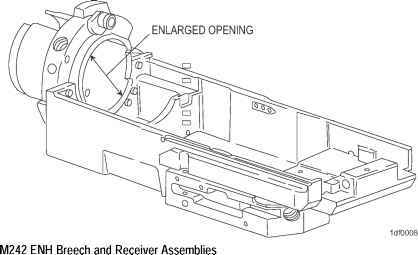 The M242 ENH receiver housing opening was enlarged to accommodate the larger breech diameter. (b) Interchangeability: The M242 ENH breech and receiver assemblies are not interchangeable with the Standard M242 breech and receivers. (a) Physical differences: The M242 ENH receiver clutch uses three concentric springs, instead of the single or double spring arrangements found on the standard M242. 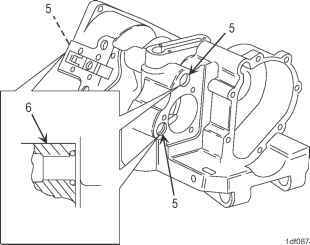 All of the triple spring clutch components have been redesigned and differ from the single and double spring clutch components. The bevel gear mating with the triple spring clutch has had material removed to provide clearance for the larger diameter clutch spring set. (b) Interchangeability: The triple spring clutch and new bevel gear set are not individually interchangeable with the single/double spring clutch or the old bevel gear set; they must be used together. The M242 ENH must use the triple spring clutch and the new bevel gear set. The Standard M242 could use the triple spring clutch and the new bevel gear set if both components are installed at the same time.